This chat will tempt to uncover which pains the participants have in their practice. I (@BrunoWinck) suggest a few ideas, a few tracks to explore. It’s not common that we start a topic from a possibly negative side but it’s also interesting to be frank and share what does go easily. 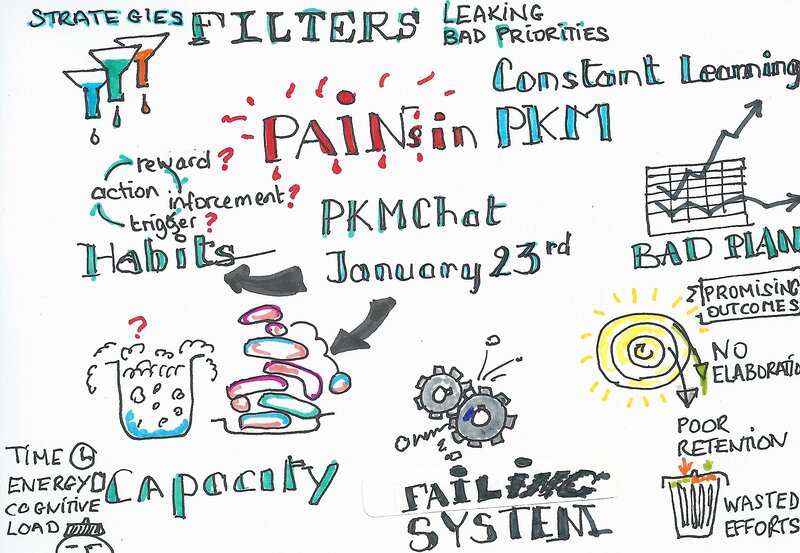 The benfit could be that others have solution or we could draft some during the time of the chat, or after as #PKMChat is about in depth discussions. The sketchnote above and the video will give you more ideas of the topic in a snap. Q1:What makes your efforts in constant learning hard, painful or inefficient? Q2:How hard is to incorporate constant learning in daily life? Q3:Do you often forget things you learned recently?Totally, only the details? Could you do better? How? Q4:Are you able to apply what you learn? Why? Is it worth the effort? What goes in the way? Q5:Are you happy with your system? What is missing in it? Q6:Are you able to capture and structure learnings from your experience?